Griffin, meanwhile, is terrified at the thought of spending the night in his new bedroom, which is located in the attic. Like Robbie in the original film, Griffin is tormented by threatening trees and creepy clowns. His older sister, Kendra, and his parents are completely oblivious to the supernatural shenanigans going down in the neighborhood. That is, until Maddy disappears. While mom and dad are at a dinner party, the gnarled tree outside Griffin’s bedroom window comes to life and snatches him up. The parents get back just in time to stop the demon tree from swallowing him up, but it’s too late for Maddy. Lured by her favorite stuffed animal, the little girl is sucked through a dimensional portal in her closet. Enter Dr. Powell (Jane Adams), the head of the parapsychology department, who steps in and offers her unique skill-set to the Bowens. With her two assistants, Boyd (Nicholas Braun) and Sophie (Susan Heyward), Powell attempts to find the missing child using some high-tech ghost-hunting equipment. Technology is a big component of Kenan’s film. According to executive producer Sam Raimi, one of the big arguments for remaking or rebooting Poltergeist is to make it more “accessible” to today’s audiences. Honestly, I’m not sure what’s inaccessible about the 1982 film, but apparently the only way today’s audiences can connect with a movie is if it’s filled with flat-screen HDTVs, smartphones, and drones. What was once a classic line in the original film — “This house is clean” — has become a hashtag. Burke is a celebrity whose arrival at the Bowen house is met with skepticism by all but Kendra, who is a huge fan of the show. Burke, utilizing some rope and a smartphone strapped to a remote control drone, attempts to rescue Maddy from the other side, but the spirits aren’t ready to let her go. 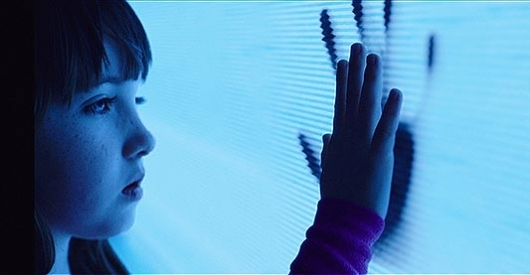 As much as I wanted to dismiss this film as a blatant cash grab, Gil Kenan’s Poltergeist remake is surprisingly decent. It isn’t a crime against cinema like the remakes of Psycho, A Nightmare on Elm Street, or RoboCop – it at least tries. The thing is, no one needed to try to remake Poltergeist. We’ve seen countless spirited successors to Hooper’s original, including recent hits like Insidious and The Conjuring. Whether it’s haunted dolls or creepy clowns, killer trees or floating furniture, the dark old house subgenre is a never-ending parade of “been there, done that.” Hell, the whole concept was already worn thin back in 2006 when Kenan directed a spirited send-up of the subgenre with Monster House. And that’s the issue with this remake. While it doesn’t do anything so blasphemous as to offend purists, it doesn’t move the needle in terms of originality either. Horror fans have seen it all – in fact, that’s why horror has such a bloodthirsty following, because fans are always looking for something new – something that pushes boundaries and goes further into uncharted, potentially taboo territory. There’s certainly nothing taboo about Kenan’s film – it’s a conventional haunted house flick with a great cast and updated special effects that more or less amounts to Poltergeist with iPhones. The house may be clean, but the foundation it’s built on is flooded with the remains of those who were there first.